Dr. Conrad graduated from the University of Saskatchewan, Saskatoon, Canada, with a Doctor of Dental Medicine in 1997. 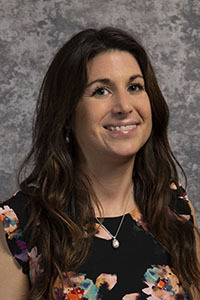 While working full time in private practice, she became a Sessional Lecturer and Course Coordinator for the second year Fixed Prosthodontics class at the University of Saskatchewan. After six years, she decided to leave private practice and pursue an academic career by enrolling in post graduate studies at the University of Minnesota. She completed the Advanced Education Program in Prosthodontics and Master of Science degree in 2006 and accepted an offer for tenure track Assistant Professor at the University of Minnesota, School of Dentistry. She has since completed the American and Canadian specialty examinations to become a Fellow of the American College of Prosthodontists and a Fellow of the Royal College of Dentists of Canada. 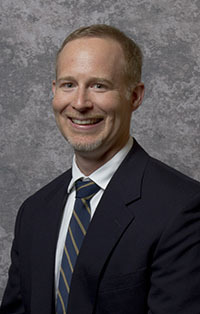 In April 2012, Dr. Conrad was appointed the Director of the Advanced Education Program in Prosthodontics and promoted to Associate Professor with Tenure. Dr. Conrad is the Course Director for PROS 7200 Advanced Clinical Prosthodontics, PROS 7210 Advanced Technical Restorative Dentistry, DENT 7111 Current Literature Review Seminar, DENT 7112 Treatment Planning Seminar, DENT 7220 Prosthetically-Driven Implant Surgery and Treatment Planning, and DDS 6496 Predoctoral Prosthodontic Honors Course. 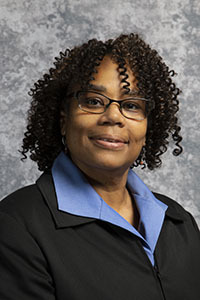 She is also a member of the Advanced Education Program Directors Committee, Core Scholastic Standing Committee, Student Affairs Committee, and Graduate School Faculty Roster. Nationally, Dr. Conrad was elected to a 3-year term as the Board Director for the ADEA Council for Hospitals and Advanced Education Programs and serves on the ACP Postgraduate Educator Committee and Question Development Team for the National Dental Examining Board of Canada. Most recently, Dr. Conrad was honored with the 2015 Educator of the Year award by the American College of Prosthodontists and was accepted as a 2015-6 ADEA Leadership Institute Fellow. Dr. Holtan arrived at the University Of Minnesota School Of Dentistry in 1986 after retiring from the Dental Corps of the United States Navy. He is presently an Associate Professor in the School of Dentistry. He has served in a variety of educational and administrative positions at the School of Dentistry including Chair of The Department of Restorative Sciences from 1997-2004. 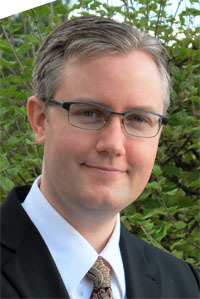 Dr. Holtan has authored a number of scientific abstracts and articles in his area of interest. He is a member of appropriate professional organizations including the American Dental Association, the American College of Prosthodontists, the American Academy of Fixed Prosthodontics and the International Association for Dental Research. Dr. Holtan is currently Director Emeritus of the Advanced Education Program in Prosthodontics. Dr. Goodkind graduated from Tufts University School of Dental Medicine in 1962 and graduated from the University of Michigan Rackham School of Graduate Studies in Removable Prosthodontics in 1964. He is a life Diplomate of the American Board of Prosthodontics. He has published extensively in refereed journals with color in dentistry being his main topic of interest. In addition, he has co-authored a textbook with Dr. James L. Baker titled Theory and Practice of Precision Attachment Removable Partial Dentures. He has lectured extensively throughout his career in the United States and abroad. 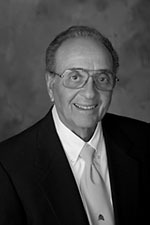 Dr. Goodkind directed the Advanced Education Program in Prosthodontics at the University of Minnesota from 1969 till his retirement in 1997. He is presently a visiting instructor and guest lecturer for the graduate program. Dr. Adarve is a graduate of University of the Philippines College of Dentistry with a degree of Doctor of Dental Medicine (DMD) in 1996 and Masters in Health Professions Education (MHPE) in 2002 from the UP-National Teachers Training Center for Health Professions. For five years, he was a part time faculty member of the UP College of Dentistry while working full time in private practice. In 2002, Dr. Adarve pursued further postgraduate programs in University of Minnesota. He completed Advance Education Program in Prosthodontics and Masters of Science Degree in 2005 and also completed Multimedia Design and Development from the Department of Curriculum and Instruction of the School of Education in the same year. In 2005, Dr. Adarve was appointed Assistant Professor in Oregon Health and Sciences University and became the Director of Fixed Prosthodontics Program. In 2007, he moved back to University of Minnesota to accept an offer to be a member of the faculty of the Department of Restorative Sciences Division of Prosthodontics, where he was appointed to be the Course Director for Pre-Clinical Fixed Prosthodontics. Since then, he held various teaching and service roles for undergraduate dental students, International students, and Graduate Prosthodontic residents. Dr. Adarve is an active member of American Dental Education Association (ADEA) since 2004. He became the President of the Educational Research / Development and Curriculum Section of the ADEA in 2011. Currently, he is the most published author in MedEdPORTAL and in 2012; he received the Teaching Excellence Award by ADEA-Colgate Palmolive Co. in recognition of his scholarship and educational innovation. Dr. Adarve is also a practicing Prosthodontist. He is a consultant of the Minnesota Board of Dentistry for Prosthodontics and also a liaison to Central Regional Dental Testing Center (CRDTS). He lectures locally and internationally and runs a study club for general dentist. Dr. Birdi is originally from Edmonton, Alberta, Canada. He received his Bachelor’s degree from the University of Alberta and his DMD with distinction from the University of Saskatchewan in 2006. Dr. Birdi then moved to Minnesota for post-graduate training in Prosthodontics, and then Periodontics (University of Minnesota). He is a Fellow and Examiner of the Royal College of Dentists of Canada, a certified specialist in Prosthodontics and Periodontics, a Diplomate of the American Board of Prosthodontists, a Fellow of the American College of Prosthodontists, and a member of the Association of Prosthodontists of Canada. He is also a member of the American Academy of Implant Dentistry, the International Congress of Oral Implantologists, the Academy of Osseointegration, International Team for Implantology, and the American Academy of Periodontology. He is a reviewer for the Journal of Oral Implantology and the International Journal of Oral & Maxillofacial Implants (IJOMI), and has been appointed to the IJOMI Editorial Review Board. 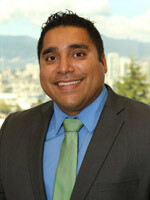 Dr. Birdi is currently in private practice in Alberta and British Columbia, Canada. His practice focuses on complex esthetic and prosthodontic treatment and the placement and restoration of dental implants. Dr. Birdi is also teaching part-time in Prosthodontics and Implantology at the University of Minnesota. 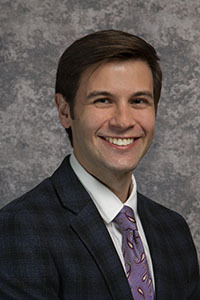 Brandon DeWitt graduated as a Doctor of Dental Surgery from the School of Dental Medicine at the State University of New York at Buffalo in 2007. He then attended a one year general practice residency at Hennepin County Medical Center in Minneapolis. Following this he completed a three year advanced training program in Prosthodontics at the University of Minnesota and obtained a master's degree. In 2011, he joined the staff of Hennepin County Medical Center's Department of Dentistry and was accepted into the National Health Service Corps. He currently enjoys providing compassionate care that truly bridges the various gaps many patients must overcome in order to access dental treatment. The hospital's integrated environment also enables him to coordinate multidisciplinary treatment goals with his medical colleagues. In addition to this, he has responsibility for clinical instruction, presentations, and prosthodontic mentoring to dental residents in the general practice training program. His current role demonstrates the function of Prosthodontics as a primary care dental specialty. 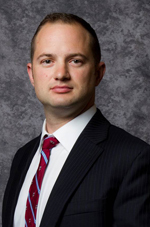 Dr. Dryer is a recent graduate of the Advanced Education Program in Prosthodontics at the University of Minnesota. He is from Dearborn, Michigan, and graduated from the University Of Michigan School Of Dentistry in 2002 and completed a general practice residency at Miami Valley Hospital in Dayton, Ohio, in 2003. Rich practiced general dentistry in Chicago, Illinois, for two years before entering the Indian Health Service as a Civil Servant where he worked and lived on the Zuni Indian Reservation for five years. Rich enjoys spending time with his family and two unruly dogs at their home in Minneapolis. Following graduation from The Ohio State University College of Dentistry, Dr. Eckert completed a General Practice Residency at Mt. Sinai Hospital in Chicago. After his graduate training in Prosthodontics at the Mayo Clinic, he remained there to earn a Master of Science degree. He was then invited to be on staff at this prestigious clinic where he remains Professor Emeritus in Dentistry at the Mayo Clinic College of Medicine. Perhaps Dr. Eckert’s greatest achievement was being elected by his peers to be a director/examiner for the American Board of Prosthodontics. Dr. Eckert has written extensively about implant dentistry and is currently Editor-in-Chief for the International Journal of Oral and Maxillofacial Implants. Dr. James is from Vancouver, British Columbia, Canada. In 2006, he graduated from University of Lethbridge, Alberta with a Bachelor of Science, Majoring in Neuroscience. During his time in Lethbridge he completed research in Emotional Cognition through the Canadian Center of Behavioral Neuroscience. Dr. James received his dental degree from the University of Sydney, Australia. In his final year of dental school, he was the student body president, and served on several dental committees including the Australian Oral health foundation Committee, the NSW ADA recent graduates committee, the Faculty of Dentistry Academic Committee, and the Dental Alumni Committee. His honors research topic “Quantifying central incisor dimensions using external and internal anatomical landmarks”, received grant funding from the Australian Dental Research Foundation. After completing his education in Sydney, Dr. James worked in private practice in Tropical Queensland, Australia. He returned to North America in 2011 to be closer to his extended family and pursue a residency in Prosthodontics. Dr. James research interests include quantifying the general population’s perception of esthetics and how dental esthetics enhances ones mate value. When Dr. James isn’t in the lab or clinics he can be found spending time with his family, mostly outdoors. His family has added “survived a Minnesota Winter” to their list of accomplishments. 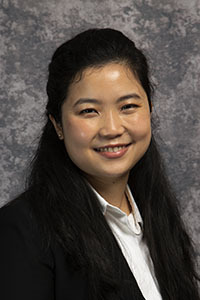 Dr. Seong is an Associate Professor, a tenured faculty in the Division of Prosthodontics, Department of Restorative Sciences, School of Dentistry, University of Minnesota. He started his academic career as an Assistant Professor in 1999 and has successfully completed his specialty board certification process from the American Board of Prosthodontics in Feb. of 2000. He is currently responsible for undergraduate implant prosthodontics preclinical and clinical instructions as well as graduate seminar and clinical instructions. Dr. Seong has earned his Master of Science degree in the area of dental implants in 2000. His continued interests in implants made him further pursue his PhD degree in oral biology. He earned his PhD in the area of biomechanics with oral biology major and biomedical engineering minor. 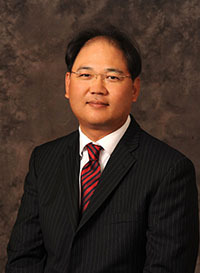 His research area covered nano-indentation technique on biologic tissue and materials, implant stability measurements, and healing bone-implant interface characterization. Upon completion of his PhD in 2006, his research expanded to the area of bone stimulation, dental implant bone cement & polymer-CNT bone scaffold developments, and clinical trials and animal studies. Dr. Seong is participating in several subcommittees on research, clinic, and curriculum in an effort of making school-wide strategic planning successful. Dr. Seong also serves public by practicing prosthodontics including dental implants in the faculty practice clinic. 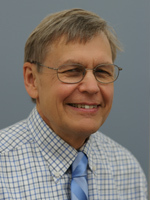 Dr. Stendahl is a 1971 graduate of Northwestern University Dental School and received his Master of Science in dentistry from Marquette University School of Dentistry in 1981. He was certified by the American Board of Prosthodontics in 1982. 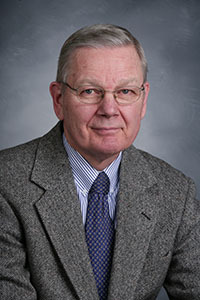 Dr. Stendahl was employed by the Department of Veterans Affairs Medical Center, Minneapolis, Minnesota from 1978 to 2007 when he retired. During this period, he served as Staff Prosthodontist, Director of the General Practice Residency Program, Assistant Chief and Acting Chief of the Dental Service. Since 1980, Dr. Stendahl has been a part time faculty member at the University Of Minnesota School Of Dentistry and is currently an adjunct professor in the Graduate Prosthodontic Program. Dr. Stendahl’s professional interests are in the areas of complete and removable partial prosthodontics. Dr. Yannie Chea grew up in Montreal, Canada, and graduated with the degree of Doctor of Dental Medicine (DMD) from Université de Montréal. Upon graduation, Dr. Chea earned the Quintessence award for Clinical Achievement in Restorative Dentistry. She then completed an Advanced Education General Dentistry (AEGD) Program at the Hawaii branch of the NYU/Lutheran Medical Center in Oahu. Throughout her education, she worked in local community health clinics and volunteered with a non-profit dental mission to Southeast Asia. 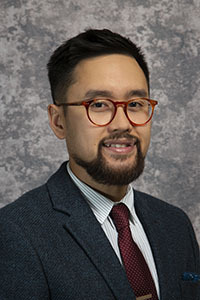 Prior to becoming a prosthodontic resident, Dr. Chea worked as a general dentist in a private practice in Montréal and served in different villages of the Nunavik in Northern Quebec. Her interest to further her knowledge of implant restorative options and provide care to patients with complex treatment and esthetic needs brought her to pursue specialty training in prosthodontics. Aside from dentistry, she loves to draw, hike, do yoga, and travel. When Mitchell was five years old, his father would sometimes let him “round” at the hospital with him, creating profound memories of the joy in seeing a smile on a patient’s face. These memories and examples of exceptional patient care are what drove Dr. Mitchell Loeb to pursue dentistry. Raised in Kansas City as the youngest of six children, Dr. Loeb ventured off to “The Little Apple,” Manhattan, KS, and received his Bachelor of Science degree from Kansas State University in May 2012. While at K-State, he was accepted in the Reserved Admissions Program at the University of Missouri-Kansas City School of Dentistry, helping him inch one step closer to his dream of being a dentist. Throughout dental school, he served as an intern at The Diastole Scholars’ Center and as a Teaching Assistant in the preclinical Dental Occlusion and Dental Morphology courses, slowly realizing a passion for prosthodontics. During his final year of dental school, Dr. Loeb was selected into the Advanced Studies in Restorative Clinical Sciences Honors Program and culminated his Doctor of Dental Surgery (DDS) degree in May 2016 with the Philip M. Jones Award for Excellence in Prosthodontics. Dr. Loeb is extremely grateful for his acceptance at the University of Minnesota, fortunate to further his learning, education in prosthodontics, and opportunity to serve patients with the utmost standard of care. 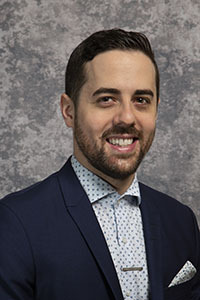 Born in Montréal, Quebec, Canada, Dr. Louis Rainville received his Doctor of Dental Medicine (DMD) degree in 2013 from the Université de Montréal. In addition to his role of Class President, he graduated with Honors, receiving the American College of Prosthodontists award, the Academy of General Dentistry award, and the Micheline-Blain award presented by the Association of Dental Surgeons of Quebec (ACDQ). After graduating, he then completed a General Practice Residency (GPR) at McGill University, where he was Chief Resident. In 2014, apart from practicing full-time in private office, he had the opportunity of teaching part-time with the GPR program at McGill University. In order to pursue his passion for prosthodontics, Dr. Rainville moved to Minnesota in June 2016. Once his prosthodontics residency is completed, Dr. Rainville plans to move back to Montréal to teach and practice. Outside of dentistry, he enjoys cycling, hockey, and spending time with his longtime girlfriend and his dog. 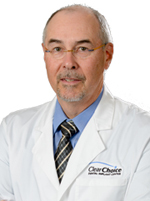 Dr. Hauger was born and raised in Omaha, Nebraska. In 2013, she completed her Bachelor of Art degree in Studio Arts with an emphasis in sculpture and a minor in Biology at Creighton University, a small Jesuit, private school located in Omaha. She discovered dentistry was an artistic and hands-on profession that combined her interest in art and science. She studied dentistry at the Creighton University School of Dentistry. She was an active member of Student National Dental Association that regularly provided oral health and cancer screenings to the greater Omaha community. In her last year, she served as a teaching assistant and taught sophomore dental students how to design partial dentures in their removable prosthodontics laboratory class. Upon completion of her D.D.S. 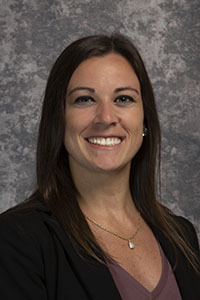 degree in 2017, she was awarded the America College of Prosthodontist’s “Your Smile, Our Specialty Award.” Ashley enjoys weight lifting and spending time with her fiancé, family and friends. Dr. Ornanong Jirapongsananurak earned her Doctor of Dental Surgery (DDS) degree with honors from Chulalongkorn University, Bangkok, Thailand, in 2013. While pursuing her DDS degree in 2011, she received the IADR/Unilever Hatton Divisional Award (Junior Category) in Singapore for her research project poster presentation. Upon completion of her degree, she served as a general dental practitioner at a community hospital in the eastern part of Thailand for two years before working as a general dentist in private practice for a year. Seeing many of her patients regain their quality of life after she has restored their oral function and esthetics, she found prosthodontics not only fascinating but also life’s little pleasure. She intends to pursue advanced study in prosthodontics in order to gain in-depth knowledge and experience necessary to manage complex restorative cases and to be able to render ideal tooth replacement solution to the patients. Born in Montreal, Quebec, Canada, Dr. Anne Beaudin received her Doctor of Dental Medicine degree in 2015 from McGill University. 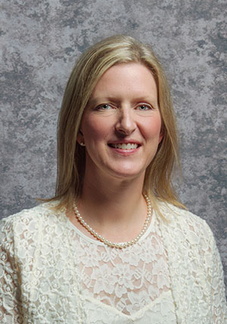 Upon graduation, she received the Academy of General Dentistry’s senior dental student award, the American Dental Society of Anesthesiology award, the American Association of Oral and Maxillofacial Surgeons award, the American Association of Public Health award, and many other honors from the McGill dental faculty. She then completed a General Practice Residency at McGill University, where she was designated Chief Resident. Prior to becoming a prosthodontic resident, Dr. Beaudin worked as a general dentist in a private practice. Her love for teaching and giving back brought her to become a clinician for the McGill dental students and to serve in several dental missions in South America. Her interest in advanced restorations brought her to accept a new challenge at the University of Minnesota. Upon completion of her specialty certificate and master’s degree, Dr. Beaudin intends to practice prosthodontics in Montreal and pursue her passion for teaching. Aside from dentistry, she loves yoga, spending time with her friends, family and fiancé, and discovering the world. 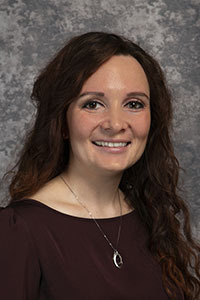 Dr. Jamie Bruno was born and raised in Auburn, New York. She attended Siena College in Albany, NY, and graduated with a Bachelor of Science degree in Biology. She then continued her education in Bradenton, Florida, where she attended LECOM dental school from 2014 to 2018. In addition to her studies, she was active in many clubs and assumed leadership roles as Vice President of AAWD, Secretary of Fitness Club, and Director of the LECOM 5K to benefit the student scholarship fund. Upon earning her DMD degree from LECOM School of Dental Medicine, Dr. Bruno was awarded the International Congress of Oral Implantologists Award. Throughout dental school, Dr. Bruno developed an interest in prosthodontics, especially removable prosthetics. Now in this Advanced Education Program, Dr. Bruno is eager to expand her knowledge on implant dentistry and improve her skills in planning and treating complex restorative cases. Outside of dentistry, she enjoys cooking, CrossFit, and softball in her spare time. 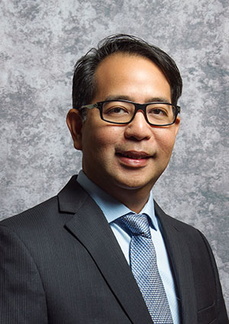 Dr. Quoc Nguyen was born in Vietnam and grew up in Montreal, Quebec, Canada. He obtained his Doctor of Dental Medicine from Université de Montréal in 2011. He then completed a one-year General Practice Residency program from the University of British Columbia focusing on treatment and management of medically complex patients in hospital establishments, such as the Vancouver General Hospital and BC Cancer Agency. He also had the opportunity to work in different community and rural clinics in Vancouver, Kelowna and Haida Gwaii. He has since then developed a keen interest in providing oral health care to underserved communities. He then returned to Montreal where he worked as a General Dentist and as a Clinical Lecturer for McGill University at the Jim Lund Dental Clinic, where he had the privilege to provide dental care to an underprivileged patient community, and to oversee treatments provided by rotating undergraduate dental students. Dr. Nguyen has always been fascinated by Prosthodontics, a specialty in dentistry that demands creativity, ingenuity and resourcefulness. He has therefore decided to pursue additional training in comprehensive and complex prosthodontics rehabilitation, and is very proud to be part of the University of Minnesota Advanced Education Program in Prosthodontics. Yvonne grew up in the small tourist town of Osakis, MN. After graduating high school, she attended Red Wing/Winona Technical College in the Professional Nanny program. She worked as a nanny for a few years around the Twin Cities area before moving back to Osakis where she worked in the Dementia Care Assisted Living facility. After a few years up there and a couple of years working in a group home in Golden Valley, Yvonne found her way to the U of M School of Dentistry in April, 2012. She first learned the ropes in dispensing and after over 4 years there, she transferred to Graduate Prosthodontics as the program secretary. 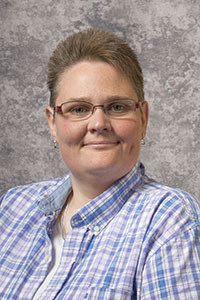 In her spare time, Yvonne likes to fish, camp, travel, participate in a bowling league and a volleyball league, and she played football for the Minnesota Vixen from the 2010 season through the 2015 season. LuAnn grew up in Alexandria, MN. After graduating from Brainerd Vocational Technical Institute in 1978 as a licensed and certified dental assistant, she worked for her hometown dentist. She then came across a dental assistant advertisement to work in Fargo, ND, with a prosthodontist. What is a prosthodontist?! Well, she soon found out. After several years working in Fargo, opportunity called again and LuAnn moved to the cities. For 27 years, LuAnn then worked for a father/son prosthodontic practice. 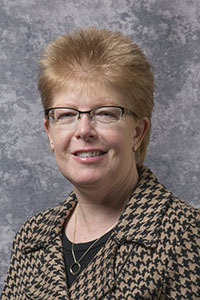 The Faculty Practice Clinic was her first home at the University of Minnesota until a move to the Graduate Prosthodontic Clinic. LuAnn lives in the east metro with her husband and has one son. She likes to read and ride motorcycles. Why does LuAnn like Prosthodontics so much? The prosthodontic field can cause dramatic changes to a patient’s life and self-esteem. It is so rewarding to play a small part in this. Born and raised in Minnesota, Emma graduated from Herzing University in August 2014. She completed the first rotation of her internship at the University of Minnesota in the predoctoral Prosthodontic Clinic. Emma enjoys prosthodontics because of the diversity of assisting duties and the opportunity to help patients and residents alike. 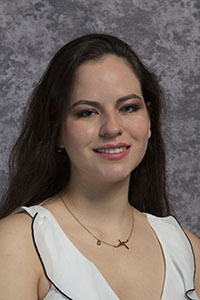 After she received her license in October of 2014, she applied to the U of M Graduate Prosthodontic Clinic and has been employed since November 2014. Emma currently resides in the north metro and she enjoys fishing, camping, softball, and snowboarding in her spare time. Delores joined the Graduate Prosthodontic Team in 2017 and brings with her a wealth of customer service expertise. 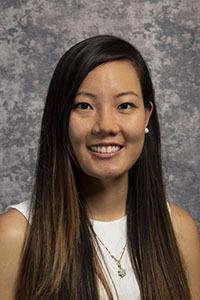 She spent several years in the School Of Dentistry's face paced, highly demanding “walk in” Oral Surgery Clinic where she supervised the front desk operations as well as coordinated faculty, resident and student schedules, and patient appointments. A strong patient advocate, her goal is to facilitate smooth and timely communication between patients and their providers to help ensure an all-around positive experience for all parties involved. When not at work, you can usually find Delores taking classes, gardening, reading, as well as biking and playing the African Djembe drums with her 13-year-old daughter.